Totem is a solid work of science fiction and a creative take on the dystopian novel. 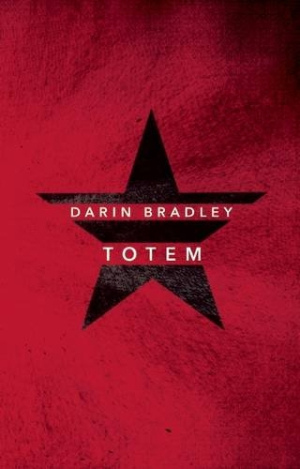 In Totem, Darin Bradley builds a future in which a city’s residents deal with the danger of ever-present radiation and the knowledge that their every action could be broadcast to the many people living outside their walls. Bradley delivers creative world building, letting his various characters and perspectives flesh out a lived-in dystopia. The story is told in chapters with alternating points of view, through characters who don’t necessarily know one another but whose stories sometimes intersect in key ways. One is a journalist for the network whose cameras capture life in the city of Aer. Another is a young man focused on secret rendezvous with his girlfriend, while another is a priest, and another is the daughter of a famous dissident. The narrative is really one of different characters each learning more about Aer’s situation, and is told largely through scenes of daily life in this dystopian future. Bradley trusts the audience not to need everything spelled out, never revealing exactly how Aer became a radiated artifact or why its religion came to revolve around a kind of stone. Instead, he focuses on what existence in Aer is like—“abatement” clothing and cosmetics people use to limit radiation damage, rotation of living situations to spread out the risk, and the constant streams of video captured by the omnipresent cameras. Technology in Aer mirrors the modern world in some ways, with handheld phones and tablets, while the city’s existence relies on food and supplies from international aid organizations. Aer in some ways is almost a human zoo, a reminder to those outside its perimeter of what life used to be like. There’s some light social commentary—how people live their lives on camera—but most of the characters that affect change are not necessarily seeking to do so. By placing everyday concerns, like love and family commitments, at the center of these characters’ stories, the larger story of Aer comes together gradually. This diversity of characters works well, allowing Totem to serve as a solid work of science fiction and a creative take on the dystopian novel.